Peterborough United manager Grant McCann was delighted with how his players carried out their attacking gameplan against Chelsea at Stamford Bridge today (January 8). The Premier League leaders won the third round FA Cup tie 4-1, but not before suffering a couple of scares along the way. Chelsea's John Terry receives a red card for a foul on Lee Angol. Picture:: Adam Davy/PA Wire. Tom Nichols reduced the arrears to 3-1 20 minutes from time, just a couple of minutes after home skipper John Terry had been sent off. Pedro (2), £33 million striker Michy Batshuayi and Willian scored the Chelsea goals. “We were determined to have a go at them,” McCann stated. “It would have been easy to sit back and exercise damage limitation, but that’s not the way I ever want to play. “We were very good in the opening 15 minutes and we should have got ourselves in front. Chelsea controlled the rest of the half, but in the second-half I felt we were excellent. “We played on the front foot and we caused them some anxious moments. Tom’s goal and the red card made me think we had a chance of getting back into the game at 3-1 down, and if we could have got on the end of a great Paul Taylor cross soon after our goal we might have made them nervous. “The fourth goal they scored killed us off though. The difference in the end was the quality of the finishing. They were ruthless and we weren’t. 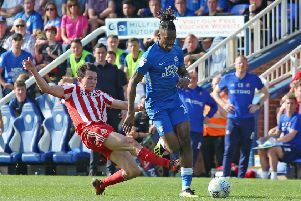 “We should have scored in the first five minutes when Lee Angol got on the end of Marcus Maddison’s cross. In fact I couldn’t believe their goalkeeper ended up with the ball in his hands. “But I can’t fault the effort and the commitment. Chelsea made a lot of changes, but they still fielded a very strong side. “I was proud of the way we went at them. We played without fear and caused them some problems. “Chris Forrester was again outstanding in the second-half. He ran the show for us against some high quality players. Posh are next in action in League One at Bury on Saturday (January 14).